From Goodreads ~ Spenser has gone to London - and not to see the Queen. He's gone to track down a bunch of bombers who've blown away his client's wife and kids. His job is to catch them. Or kill them. His client isn't choosy. But there are nine killers to one Spenser - long odds. Hawk helps balance the equation. The rest depends on a wild plan. 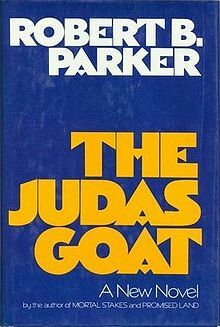 Spenser will get one of the terrorists to play Judas Goat - to lead him to others. Trouble is, he hasn't counted on her being very blond, very beautiful and very dangerous. Spenser is a private investigator in Boston and has been hired by Hugh Dixon, a millionaire, to find the nine members of a terrorist group that bombed a London restaurant where he and his family had been dining. His wife and daughters are killed and he was left a paraplegic. Spenser heads to London to start his investigation. He finds some of the members and hires his friend, Hawk, to help him find the others. This takes them from London to Copenhagen to Amsterdam to the Montreal Olympics. This is the fifth in the Spenser series (there are currently 46, with the last six written by Ace Atkins after Parker's death in 2010). I've read many in the series over the years (and have enjoyed the series) but I can't remember where I'd jumped in. I know I hadn't started at the beginning so have started reading them from the beginning of the series. Though it is part of a series, it works as a stand alone. I liked the writing style ... I find it humorous at times. Spenser is a tough guy with a wisecracking sense of humour. This book was written and is set in the late 1970s so is dated with some of its references and lingo. It's written in first person perspective in Spenser's voice. As a head's up, there is swearing. I wasn't crazy about this book. I thought the storyline was uninteresting and boring. And I found it hard to believe that Spenser got away with killing or injuring as many people as he did worldwide yet there was no ramifications. While I don't mind that Spenser is dating Susan Silverman, I find their conversations unbelievable. They are in love, have been dating for a few years, yet talk to each other like they are teenagers (they are about 40). I like the friendship between Spenser and Hawk but it is tiring at times with Spenser talking like the rich white plantation owner and Hawk talking like the indentured slave (Hawk is black). I found Kathie, one of the terrorists, to be an unbelievable character when she is "given" to Spenser and becomes submissive throwing herself at Spenser and then Hawk (her terrorist group is against blacks).